Frasers Logistics & Industrial Trust's 1QFY9/19 DPU of 1.78 Scts was in line, at 25% of our FY19 forecast. Strong income visibility with minimal lease expiries, low gearing provides room for inorganic growth opportunities. Maintain ADD and Target Price of S$1.19. FRASERS LOGISTICS & IND TRUST (SGX:BUOU) reported 1QFY9/19 revenue of A$59.5m, up 40.3% y-o-y, boosted by contributions from its European, Australian and recent Netherlands acquisitions as well as surrender fee of A$1.2m from a tenant in Australia. This was partly offset by the divestment of two Australian assets in Aug 2018. 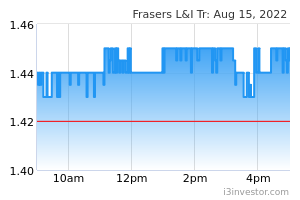 Frasers Logistics & Industrial Trust's 1Q DPU of 1.78 Scts was down 1.1% y-o-y due to an enlarged unit base and weaker hedge rate of A$1: S$0.982. 1Q DPU was in line, at 25% of our FY19 forecast. Portfolio occupancy stayed unchanged q-o-q at 99.6%, with weighted average lease to expiry of 6.71 years. Frasers Logistics & Industrial Trust renewed two leases in Victoria, Australia during 1Q totaling 21,140 sq m at a negative reversion of 7.2%. Both leases come with annual fixed escalations ranging between 3% and 3.5%. The lease extension in Port Melbourne was fairly stable at -0.1% reversion as supply conditions in that sub-market remained fairly tight. The other was a 3.67-year lease extension for 17,878 sq m of space in Keysborough, Melbourne at a -9.2% reversion, although the new contracted rental rate is still above the original rate secured. Frasers Logistics & Industrial Trust has minimal lease expiries of 2% and 5.8% for the remainder of FY19 and in FY20, respectively. This provides the trust with strong income visibility. In addition, the Australian industrial market continues to remain robust, particularly in Sydney and Melbourne, and according to Jones Lang LaSalle, spot rents are expected to remain stable in Sydney and will continue to trend up in Melbourne. Frasers Logistics & Industrial Trust has a gearing of 35.6% at end-1QFY19, with little refinancing need for the remainder of FY19. An estimated 79% of its interest rate exposure has been fixed. Based on a ceiling of 45%, Frasers Logistics & Industrial Trust would have potential debt headroom of A$534m to pursue acquisition growth opportunities. Sponsor pipeline include properties in Australia and Europe. We leave our FY19-21 DPU estimates unchanged post results and maintain our DDM-based Target Price of S$1.19. Positive rental reversions within its Australian portfolio are potential re-rating catalysts while downside risks are weak Aussie dollar and Euro.